We shipped 3 mutagenesis plasmids (#1-3). All mutagenesis inducing plasmids contain an arabinose inducible promoter PBAD. Upstream of PBAD the araC protein is encoded in the opposite direction and regulates the activity of the PBAD promoter. The expression cassette downstream PBAD comprises multiple, different mutagenesis supporting elements, e.g. error-prone polymerase subunits. According to literature RN46 the mutagenesis plasmids #1-3 were expected to cause increasingly high mutation rates. Due to exceptionally high mutagenesis levels of E. coli cells transformed with one of the mutagenesis plasmids, these cells can more quickly adopt to environmental changes. Hence, one way to measure the mutagenesis levels is simply to quantify the level of spontaneous antibiotic resistance acquisition. Therefore, E. coli were transformed with mutagenesis plasmids or remain untransformed (as control) followed by incubation in presence or absence of different antibiotics on agar plates. After 18-21 hours of incubation at 37 °C, colonies are counted. A higher number of colonies (i.e. clones with spontaneous resistance acquired) thereby indicates a higher mutation rate in the corresponding E. coli population due to the presence of the mutagenesis plasmid. To decide which mutagenesis plasmid to recommend to future iGEM teams for in vivo directed evolution approaches such as PREDCEL, it was essential to determine the mutagenesis plasmid setup most robustly functioning across different laboratories. The results of iGEM team BOKU Vienna, ETH Zürich, Freiburg and Stuttgart indicate that MP #1 induces mutations most reliably . Hence, we recommend to use mutagenesis plasmid #1 for PREDCEL experiments, which is also noted in our corresponding RFC. Collaborating with the iGEM Team Freiburg we cloned a positive control for a subproject of their CARTEL™ project. Under normoxic conditions HIF1A cannot interact with HIF1B to form the transcription factor HIF1, because its hydroxylated and marked by the E3 ubiquitin ligase for degradation by the proteasome ziello2007hypoxia. Therefore the elimination of the two hydroxylated amino acids, that are prolines at the positions 402 and 564, would generate a HIF1A, that is stabilized and interacts with HIF1B under normoxic conditions yasui1988expression to activate the hypoxia response element (HRE). Because we wanted to collaborate with this year’s iGEM Team Freiburg , we offered to help them with our Golden Gate cloning expertise to perform a site directed mutagenesis and generate the constitutively active HIF1A. It would be used Freiburg as a positive control for CoCl2 induction in analysis of HRE. For the aforementioned two amino acid exchanges alanine to proline we decided to utilize PCR amplification followed by Golden Gate cloning for site directed mutagenesis. To insert the two point mutations three steps were performed. We divided the ~7.9 kb plasmid into three fragments by (i) PCR amplification. The primes were designed with Golden Gate overhangs and BsmBI restriction sites. Primers to split the backbone into two fragments in the ampicillin resistance ensured that plasmids with re-ligated fragments would not provide ampicillin resistance to the E. coli cells. The extension PCR was performed following the standard PCR protocol for Q5 polymerase. In a second step an agarose gel proved that all amplifications worked out well and after gel extraction (ii) Golden Gate assembly was performed following our standard Golden Gate protocol. The plasmid was (iii) transformed into chemically competent TOP10 strain E.coli cells and plated on LB agar plates supplemented with ampicillin to select successfully transformed E. coli cellsltransformed E. coli cells. To evaluate the assembly and test whether the point mutations were successfully inserted, the sequence of HIF1-alpha containing the point mutations as well as the regulatory element (CMV) promoter were verified by Sanger Sequencing. The sequencing results were positive and therefore, we are happy to have helped the iGEM Team Freiburg with the cloning of a constitutive HIF1-alpha. As we had several PCR problems ourselves in the beginning of our project, we asked our advisors for help and created a PCR troubleshooting protocol, which you can find on our protocol section. Because we considered it to be helpful for other teams as well, we decided to offer help for all other iGEM teams: our First Aid Service for PCR Problems. Happily we could help some teams overcoming their PCR problem. Unfortunately, Hamburg did not have enough time at this stage of the project to order and test the new primers designed by us. Therefore, they will only add the primers to the gene to facilitate the work for the next group who wants to work on the gene. Even though the gene amplification was not successful in the end, we they emphasized that they are very grateful for the help we provided and the effort we raised to getting fixed their PCR problems. It was also a pleasure for us to work with you. Inspired by this years' iGEM goes green initiative launched by the iGEM Team Dresden, we designed a model that has provided us and will provide the iGEM community with a versatile tool to minimize the amount of medium used in the process of operating Phage-Assisted Continuous Evolution (PACE) to develop enhanced proteins. With the help of this model, it is possible for everyone to calculate the appropriate amount of medium that is needed to operate a successful implementation by tuning all parameters. We also provide information about PACE applications conducted by others in the past to compare the values to. For more detailed information about our iGEM goes green activites and to get more information about our medium consumption model please visit our iGEM goes green page. 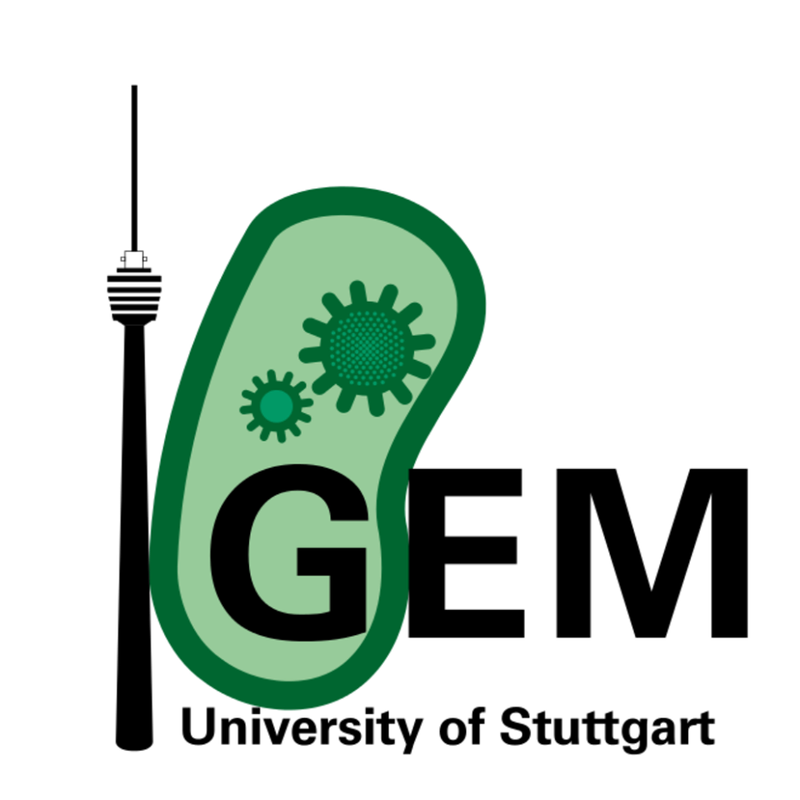 iGEM Stuttgart did not only participate in our mutagenesis plasmid inter-lab study but also we helped them according several issues. As they are participating in iGEM for the first time, we gave them general advice accoring time management and helped them to set priorites. To reach their goal for "lighting up the pipe" they also needed to include safety aspects and asked us for some inspirations. They asked us to design a killswitch for their bacteria and we suggested to use an optogenetic-killswitch to ensure, that the E. coli are killed after they "lighted up the pipe" by secreting keratinases, lipases and esterases. We are happy that you integrated our ideas and suggestions into your project and that we hereby could contribute to make your project safer for the environment. Bringing science closer to the public is a major goal in iGEM. As communicating scientific content can be challenging because complex issues need to be unraveled to easy understandable terms, one step could be translating scientific texts into many languages. Following this idea, the iGEM Team KU Leuven started a translation center and asked all teams to participate. Each team uploaded its project description and translated other project descriptions into their mother tongue. This is a first step towards simplification and easier communication with the general public because one barrier, namely the language barrier, can be overcome with the translation center. We translated several project descriptions into German and could thereby hopefully contribute to a better communication between scientists and a broad public. Participating in the Postcard campaign of Duesseldorf-Cologne was a real success. Thanks to the inspiring and eye-catching designs of all postcards we started talks about synthetic biology, GMOs and other issues addressed by over 36 postcards we received. Respect is an essential iGEM value and tolerance an important aspect of it. We were thus very happy to support the tolerance campaign by iGEM Team Technion (Israel). All our creativity was used to draw this lab-associated tolerance lettering and we can hopefully contribute to draw more attention to the fundamental value of tolerance in the scientific community and in public. The Boston University Hardware team worked with microfluidic chips and wanted to establish an archive with different designs and protocols. Their goal is to fit the archival structure to any needs of its users. To support this project, we filled in their survey and could thereby hopefully contribute to a well applied, sustainable design of their archive. iGEM Team BIT worked on a liver cancer related project and wanted to integrate the opinion of us iGEMers into the design of their project. We answered their survey and are looking forward to seeing their great ideas realized. Shipment of biological material often faces problems when cooling is required and long distances need to be conquered. This is particularly true for less developed countries and regions with no direct access to an (freight) airport. The Amazonas Brazil team wanted to collect information from all over the world to get a deeper insight into import and export regulation processes of countries around the world. We hope that we supported your collection of information by thoroughly answering your questionnaire. Environmental pollution and climate change are two of the major challenges we desperately need to solve towards our agreed goal of a sustainable human civilization on our planet. The iGEM Team Pasteur Paris focused on environmental issues and highlighted the problem of air pollution, which is particularly strong problem in quickly industrialized countries with low standards of waste air cleaning in fossil fuel power stations, industrial facilities and transportation vehicles. To receive an impression about the air pollution situation in different regions all over the world they created a comprehensive survey. We hope that we could convey an impression about the situation in Heidelberg, which fortunately is a rather small, bicycle-friendly city closely surrounded by five beautiful nature reserves. iGEM Team Heidelberg is also taking part in the iGEM goes green initiative by team TU Dresden. The iGEM Team UNebraska-Lincoln aims at inhibiting the methane production in cattle and wanted to integrate the general public opinion into the design of their project. All members of iGEM team Heidelberg filled in their survey and we are looking forward to helping you gather information and maybe even contribute to decreasing the alarming speed of climate change. In order to tackle the cholera disease, the iGEM Team Toulouse asked everyone to answering their questionnaire to receive an impression about the informational situation according to cholera disease. Hopefully we could contribute a little bit to succeeding with your project on eradicating Vibrio cholerae. To investigate the public´s view on genetic modification for pharmaceutical production the Cardiff iGEM Team created a survey. They aim at treating the Grave´s Disease, an autoimmune disease affecting the thyroid, with the help of genetically modified organisms. We filled in their questionnaire and hope that they succeed with realizing their innovative therapeutic approach. To gain more information about GMO perception by the public the iGEM Team Ionis Paris conducted a survey we took part in. They aim at creating an interactive map to make the comprehensive information from their interesting questionnaire easily accessible. This map contains regimentations and opinions about GMOs and could provide novel insights into region-specific, public perception on the creation and use of GMOs. No doubt that CRISPR is a breakthrough technology that should be easily accessible by any (responsible) researcher around the globe. To establish a simple and standardized methodology for applying CRISPR the iGEM Team Amazonas Brazil created a survey to communicate with other iGEM teams and exchange information about problems when working with the CRISPR technology. We participated in this survey and are eager to see your solutions for an easier handling of this method come into play in iGEM. The iGEM Team Munich collected opinions about diagnostic devices in a survey that was distributed to people with different professional backgrounds. In certain countries access to regular medical care is limited, either due to regional fluctuation in the density of hospitals, pharmacies and doctors or due to country-specific healthcare laws. This issue affects millions of people world-wide, both in developing as well as modern countries. iGEM Team Munich aims at developing diagnostic devices, that could be used at home and provide people with diagnosis and hence medical care that would otherwise have no access to.